They Don't Make Furniture Like They Used To..
or email: jsolovey1@gmail.com for quotes. We make a special collection of historic reproductions and elegant designs of traditional bench made, hand-finished Country European Style, wood and iron furniture... produced to your specifications. Our furniture is produced with emotion and respect for authentic detail and scale; commissioned by those who identify themselves with standards of excellence. Quality second to none. 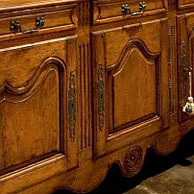 Collection Reproductions produces a distinctive collection of Old World Style hand crafted furniture. Orders can be selected from our extensive line of over 150 standard styles, or modifications can be made to meet your custom requirements and specifications. Our products are produced by traditional methods; typically the same as used in quality European furniture making in past centuries. The main focus of our line is a European country look, using select Oak, Alder, Pecan, Pine and Cherry woods. We also produce Wrought Iron furniture representative of antique European design. Our company has an extensive selection of over 150 standard items, produced by hand, (with some modern tools as well) under one roof as they're ordered, especially for the customer, using the same type of tools as artisans used 200 to 300 years ago. 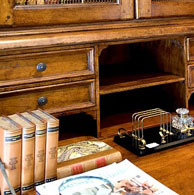 Collection Reproductions is one of the few companies that still manufactures a quality product one at a time by skilled cabinet makers and craftsmen. From start to the final finish, nothing is made on an assembly line which insures a quality unobtainable in larger factories of mass production. This method also allows custom work to be produced along with standard catalogue items without interruptions in the factory schedule. Requests for custom quotes are welcome and encouraged. 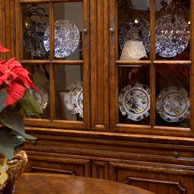 Collection Reproductions sells to design professionals, quality furniture retailers and the public direct. You may purchase through a professional Interior Designer, one of our showrooms or directly from us. Call for details.